Genius is a pretty strong helicopter. However, if it crash on the rotor in an upside down flight, chances are that the servo gears will strip. Easiest fix is to open the top of the servo, and check to see which gear is broken. Usually is the pinion next to the output gear that is stripped. Just gently spread the gears apart and rotate to a new section. You can rotate the gears at least twice, and may be up to 3 or 4 times. Then you have to get a new servo. Servos are around $17 each. Ouch. Note: If you are just sport flying, and not doing 3D, this mod is not necessary. As it allows the servo horn to slip, you may have to reset it more often in a crash. That is the disadvantage of this mod for sport flying. Servo savers are used in almost all r/c cars. Is a lost motion device that all the servo arm to rotate in a crash to save the gears. Is like a mechanical fuse. It will self reset after a crash. Unfortunately, Wakera does not sell a servo saver for the Genius. Currently, nobody is makeing one for the helicopter either, so you will have to make one yourself. Space is very tight in the Genius, so the servo saver have to be very small and compact. After some trial and error, this is probably the best solution that is also easy to make. This mod will probably take 15 minutes, and is relatively easy to do without much disassembly..
1. Remove the servo from the helicopter, Pull the stick that holdes the canopy out. Is just a press fit. Lift the servo holder up. Remove the servos. No need to unplug the servos. 2. Remove the servo arm screw, and remove the servo arm. 3. Cut at location shown with a razor blade or x-acto knife. The plastic is pretty easy to cut. Be sure to use a new knife to cut. After cutting, you should hardly be able to see the cut. Dull knife may spread the servo apart, and loosen the tension. 4. Install the servo arm back onto the servo. Do not tighten the screw to much because it will separate the servo arm at the cut making the servo saver too loose. Use some locktite or put some nail polish on the screw to glue it to the servo if it makes you more comfortable with a slightly loose screw. 5.Optional: Servo saver should be quite tight. However, over time, the servo arm may get loose. Use shrink tubing on the arm to tighten it. Better would be to use an o-ring to keep it tight. The one below was an early trial. I cut too much off the arm, and made it too loose. Helicopter still flew fine. I can't get it to slip in the air. However, just to feel safer, I put the shrink tubing on the arm to tighten it. An o-ring would probablly be better since is elastic. There are probably various variation on what you can do to loosen or tighten the servo saver. F.a.r.m.e.r. suggested using a fuel tubing. For me, I don't see any reason to add fuel tubing for extra tension. Tried slaming the transmitter stick all around like those world champion 3D pilots do in youtube, and the servo saver held. Also tried holding it, and jerking the helicopter up down and around at full throttle. Servo saver held also. That is an option in case some people wanted a tighter servo saver. Maybe the plastic starts to loosen up after many crashes. Just like in r/c car, the top drivers sometimes want a tighter servo saver for more precision at the expense of servo gears wear. 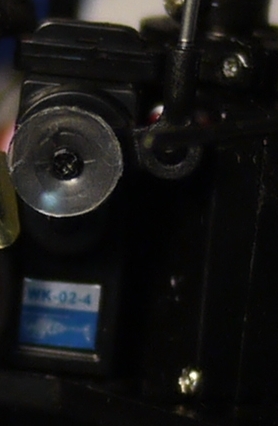 Update: bytemucher cut a washer over the servo arm so that the o-ring does not come off. See post. The servo arm is connected to the servo by a spline. In the stock servo arm, the spline is a slight press fit. Is a tight connection,and does not allow the servo arm to slip. With the modified spline, a cut is made to the servo arm hub. Now the servo arm can spread apart slightly under load at the hub. At hight loads, the servo arm will spread apart wide enough to allow the spline to slip. Because the servo arm can spread apart, the spline can slip in the servo arm without damaging the spline. Now it becomes a servo saver. In normal operation, the servo arm hub is stiff enough to grab the spline, but under high loads, the servo arm spread open enough to allow the spline to rotate instead of transmitting all the loads to the gears and damage the gears. Is like a mechanical fuse where the servo arm is the weakest link, and it slip before damage to the servo gears. And because the servo arm hub can spread open, it can slip over and over again without damage to the spline.